The transformational investment programme at one of Leeds’ most iconic buildings has taken another ‘step’ forward, following a recent art installation by artist, Alice Smith. Alice, who is a commercial book designer, illustrator and art director for The Idler magazine, has created a piece of work called ‘Stepping in Time’ where varying fashion styles throughout the history of Leeds Corn Exchange, dating back to 1860, now feature on the ground floor pair of staircases. Georgina Maud, creative lead at award-winning property company Rushbond, which owns Leeds Corn Exchange, said: “As part of our commitment to this ongoing development programme, we wanted the stunning, sweeping staircases to become an exciting backdrop for rotating designs by talented, creative people. This goes hand in hand with our bold development approach, where we’ve embraced and encouraged the contrast of history with new creative talent, just like we’ve done at the main entrance. “Alice’s work is extremely eye-catching and thought-provoking for everyone visiting Leeds Corn Exchange, as they explore the amazing range of fashion, music, design and lifestyle shops, as well as enjoying the unique food and drink on offer in this creative haven in the heart of Leeds. “Throughout our investment programme at Leeds Corn Exchange, the focus has been about enhancing the building’s future, whilst also linking back to its rich nineteenth century heritage and exchange culture. Alice’s ‘Stepping in Time’ epitomises this, and the reaction has been phenomenal”. Alice said: “The Leeds Corn Exchange is a gem of a place, I have fond childhood memories of shopping there in the nineties. The outline of the challenging project brief was to encourage visitors to ascend the stairs to the upper level shops. I wanted to create a design that would be sympathetic to the architecture, echo the bright new colour scheme of the renovated doorways, whilst lending a nod to the building’s age and also conjuring up the feeling of walking in the footsteps of people from the past”. 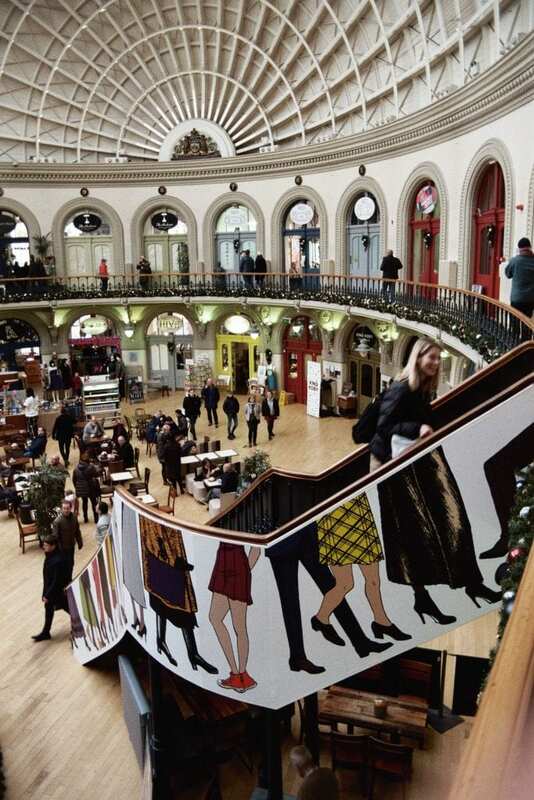 Centre manager at Leeds Corn Exchange, Adam Warner, added: “Leeds Corn Exchange is a place where lifestyles are fashioned – not just by clothes but by their way of being. We wanted a fun project, produced in a creative and authentic way, with skill and thought, by a creative artist who has a deep connection with the place – and Alice has really achieved this”. Since acquiring the building, Rushbond has built a stunning new fully accessible entranceway at the front, which now incorporate a beautifully curved sloping stone ramp, designed to blend seamlessly with the original 170 year old steps. Last year Rushbond also unveiled ‘The Course of Days’ art installation, which uses cutting-edge digital technology to explore the changing seasons and the rhythms of passing time. Created by Output Arts, which is a partnership between Andy D’Cruz and Jonathan Hogg, who specialise in creating immersive audio-visual installations that draw on natural environmental conditions and phenomena, with the assistance of arts advisor Kerry Harker. The installation now takes pride of place in the entrance of the Grade I listed Leeds Corn Exchange. Leeds-based poet, Ma Maposa’s words have also been hand-painted onto the inner circle that divides the ground floor and lower ground yard, and all of the retailers’ doorways have been painted in fresh new independent colours.